This year has been FULL of amazing books and I feel like I'm giving so many of them 5 star reviews. But it's because they have been SO GOOD. 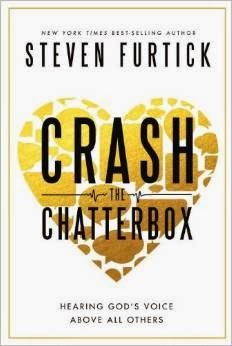 Crash the Chatterbox by Steven Furtick was my first introduction to Steven's writing. I chose it from the blogger review site from Multnomah Publishers, because it kinda, sorta, maybe sounded like it would be a little interesting, but I honestly wasn't expecting much... and there were no other books that really stood out to me. Well, I think it was totally a God thing, because right now, right at this time, I needed this in my life. For so many reasons. I got the book... and it sat on my shelf for months. And I finally, this last week or two got around to pulling it down and starting in without much excitement... other than to get it done so I could order another book. Steven has a very engaging style and a great sense of humor in a bit of a hipster kind of way. But man, he hammers home the truth like only an aged pastor can. And the truth will set me free. He gives SO MUCH real. So MANY hands-on ways to deal with the mean self-talk I deal with all the time. He calls it out for what it is (lies, from the enemy) and gives real ways to deal with it, and focus instead on the truth God whispers. “You’re doing better than you think you are. It’s less about you than you think it is. You matter more than you think you do. It’s working. It’s not in vain. **this post contains affiliate links which help me get more books to review and share!